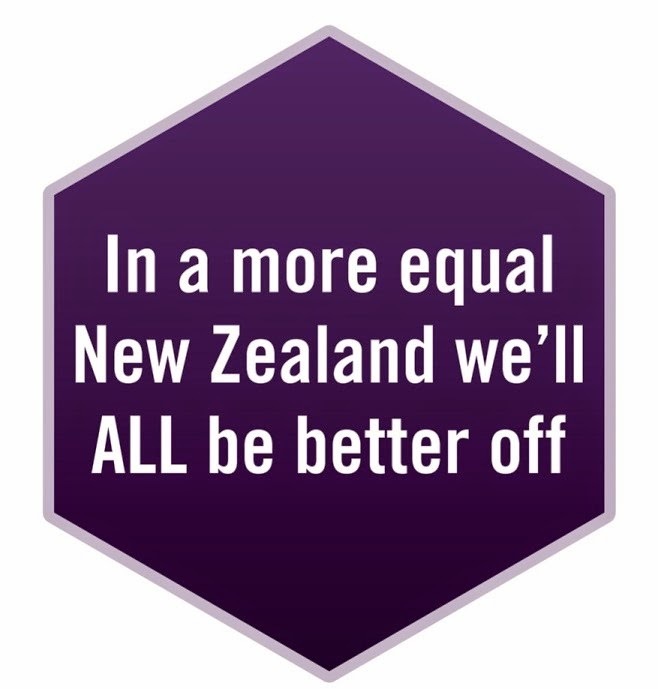 Earlier this year the Government established a Welfare Working Group (WWG) to look at ways to reduce long term welfare dependency in New Zealand because that government maintains that current welfare provisions are unsustainable. The WWG has recently released the first issues paper (in summary and full text form) and are asking for public feedback by 17 September. Very briefly, the WWG concluded that the current Social Security Act is fit for purpose. This is hardly surprising given that under Labour the Act was amended in 2007 to reflect a work first philosophy. The WWG have articulated five high level principles for the benefit system, the most important message being that paid work is the best means to achieve personal and financial well-being. Whilst at face value this appears to be true there are two fundamental flaws to this premise. Firstly, work does not necessarily lift people and families out of poverty – much of the work that long term beneficiaries could get (after the recession) will be poorly paid, insecure and in non-standard hours. (This has been the outcome for American families under various welfare-to-work programmes.) Secondly, for Sickness and Invalids Beneficiaries (two target groups for the WWG) achieving the best level of wellness needs to be their primary focus and work may or may not be part of this. Their third principle talks about the benefit system promoting responsibility, accountability and mutual obligations. Unfortunately the obligations fall largely on beneficiaries through the new work expectations being legislated for. It would be good to see the State meeting its obligations to find appropriate supported employment for long term beneficiaries – and this means more than making people prove they are looking for jobs that don’t currently exist. To do this properly requires a significant investment in training and education, in good quality affordable childcare and incentives and supports for employers. The issues paper is largely descriptive but does give an indication of how the issues are being framed and where the group is heading. An options paper is to follow that will be much more specific in terms of the range of responses available to the perceived problems of long term unsustainable welfare dependency. It is clear that the recommendations will align with the Government’s ‘unrelenting focus on work’. By the end of the year a final paper will be drafted with recommendations to the government. This will not be public and the government is likely to only select the recommendations that are politically palatable. In the meantime anxiety is high as the level nature of reforms is unknown. Suffice it to say NZCCSS will be making a submission and we encourage others to do so as well. The Alternative Welfare Working Group is running a number of public meetings over the next six weeks where a much more meaningful and open discussion will be encouraged. See the end of Policy Watch for the details. They are also inviting people to make submissions and are not restricted by the official WWG’s terms of reference. Earlier this year the government indicated that it was going to review all Crown assets to ensure the best use is being made these resources. HNZC holds assets worth $14b and a review was announced specifically related to the delivery of social housing. Part of this review process included the establishment of a Ministerial Housing Shareholders’ Advisory Group which was tasked with providing the government with advice on “how to ensure that those people with the greatest need are provided with suitable housing, in the highest priority locations, for as long as their need exists”. (more detail in the Terms of Reference). Their report, Home & Housed: A Vision of Social Housing in NZ, went to Government at the end of April, however it has only recently been made public on the Department of Building and Housing website. Community Housing Aotearoa (CHA) has made initial comment on the report and has included a section on their website. They have a particular interest in pages 55-61 on growing the contribution of the third sector. The Dominion Post and NZ Herald covered the key points of the report. One of the best articles was from Philippa Howden Chapman, a Professor and Direcotor of He Kainga Oranga - Housing and Health Research Programme at Otago University. She points out the report ignores research that shows better short term health outcomes for state housing tenants compared with those in private rentals relying on the Accommodation Supplement. She also points out that we shouldn’t necessarily follow the British move to end life-long tenancies. Given the low provision of social housing by the third sector in NZ and falling home ownership rates, particularly for Maori, Pacific and low income families – ‘the safety net role of state housing becomes even more important to ensure the wellbeing of vulnerable families’. The Advisory Group will now engage with the wider sector regarding the recommendations in the report as requested by Government. This consultation will take place over the next six weeks with the Group reporting back to the Government on that process later in the year. Six weeks is not long to consider such a significant reshaping of state housing and suggests that government is keen to forge ahead in the direction already outlined in this report. • available for those most in need (an estimated 5000 state housing tenants pay market rent, some of whom are high income). In the speech the Minister emphasises the government’s commitment to state housing and to retaining income related rents. However some difficult decisions need to be made because “the reality is Housing NZ can’t house everyone that comes through its doors”. If I was in a HNZC house and paying market rent, or had been in a state house for more than ten years I’d be feeling a bit worried. The ‘house for life’ expectation is under the microscope. “There are some huge issues for us in terms of the numbers of whanau in severe and persistent housing needs. These whanau are seriously at risk because of their housing circumstances with houses that are unsuitable, inadequate or unsustainable. We know that 67% of all Maori are renting or boarding – with approximately 72,000 Maori occupants residing in state housing. More than 55.7% of Maori living in state housing are under the age of twenty. We also know that Maori are particularly prevalent amongst the homeless. And we are inevitably concerned when we learn of the intention to reduce the waiting list significantly, by being able to free up spaces on the waiting list for people with real need. NZCCSS also shares these concerns and is fearful that the reconfiguration of housing stock will not address that chronic shortage of affordable housing. In fact, it could make it worse. It is clear that HNZC is facing significant challenges. Many state houses are in the wrong places or are the wrong size. Money is always tight and every government struggles with the cost of maintenance versus the cost of increasing supply (obviously both are actually needed). Other recent problems related to state housing include rent HNZC staff strikes over pay issues (compounded by the feared backlash staff were anticipating from disgruntled tenants as a result of “a planned maintenance cut of a whopping 21%”(comment by PSA National Secretary). Eviction notices from state houses have also nearly doubled in the five months of 2010 compared to the whole 12 months of 2009 reflecting the harder line the corporation is taking with ‘problem tenants. At recent gathering of community housing organisations, a commitment was made to exploring Affordable Home Ownership options and growing a new supply of affordable housing. A report of this important meeting – convened by Community Housing Aotearoa sets out some key elements of what it might take for the community housing sector to play a bigger role in provision of affordable housing – both home ownership and rental. Very timely given the Shareholders Advisory Group interest in growing community based social housing provision. While on the topic of housing I came across this piece of research by a Professor at the University of Glasgow. Teams from six European countries took part in the research. One of the findings was that “income transfers [read Accommodation Supplement and Income Related Rents for NZ] to help households with their housing costs were found to have the strongest impact in helping lower income households”. In Britain the working poor were found to have only marginally better housing outcomes than those on benefits. The mismatch between the labour market and the housing market were also highlighted, specifically the lack of secure and sufficient income from employment to maintain housing – “long term labour market marginality is often an important driver of homelessness”. Let’s hope that the Government in its reviews of both welfare and housing policies recognises and maintains that critical components of these policies that give protection to the vulnerable. The Household Labour Force Survey (HLFS) for the June quarter was recently released by Statistics NZ and shows an 0.8% increase in the unemployment rate to 6.8% in the last three months. This means 19,000 people lost their jobs during this period, bringing the total number of people looking for work (full and part time) to nearly 160,000. The statistics regarding youth employment particularly for Maori and Pacific peoples are most alarming, with both groups aged 15-24 years having an unemployment rate of nearly 29% (the all ethnicities rate for the same age group is 17%). The Department of Labour collects data on the broader issue of youth disengagement via the rate of those Not in Education, Employment or Training (or NEET). For the year ending June 2010, 20% of Maori male youth (those aged 15-24 years) were NEET (compared to the all ethnicities rate for this age group of 11.8%). One of the government’s responses to rising unemployment is to announce a ‘reconfiguration’ of TOPS training courses for beneficiaries “to have a better emphasis on getting people into work. 40% of TOPs Training Courses are to be carved off and given to MSD to invest in short term employment focused training. More detail on the latest HLFS will be covered in the next issue of the NZCCSS Vulnerability report due out in early September. This article looks at studies that show how growing up in poverty can have ‘a direct impact of the organisation and function of the brain’. By this they mean problems with concentration, impulse control, memory, over-sensitivity to stress and the like. While these studies remind us of the importance of continuing to advocate for policies to address poverty it was heartening to read “that if parents can provide warm, consistent nurturing, they can counteract many of the effects of too little money, too little food and too little safety – the ingredients that often make up an impoverished childhood’. Of course, being a good parent is much easier when you have sufficient income to provide the basics. The Social Services Select Committee has reported by to Government of the Social Assistance (Future Focus) Bill. They have made a number of recommendations to amend the Bill none of which significantly change the direction or principles of the bill. The committee has recommended a name change to the Social Assistance (New Work Tests, Incentives, and Obligations) Amendment Bill. The committee obviously took on board Sir Geoffrey Palmers criticism of its meaningless ‘future focus’ wording. (Sir Geoffrey made this point in his oral submission before ours). Other changes include a more punitive sanctions system. If a person who has been sanctioned (& lost 50% of their benefit) does not re-comply in four weeks they can have their benefit cut another 50%. The Select Committee makes this recommendation to “prevent people from choosing to live indefinitely on a reduced benefit rather than comply with their work test requirements”. (Note: the second sanction would not apply to those with dependent children). One does wonder what planet these people inhabit – try living indefinitely on half a benefit and then half it again! It’s likely the legislation will have its next reading Parliament in the coming weeks and with the support of National and Act Parties it will become law. Wesley Community Action is once again hosting Dr Barry Duncan who will be delivering a 2 day workshop on Partnership for Change – partnering with clients to make services effective, accountable and just. Visit their web page (latest news on right hand side) for more details. Employers will be able to demand a medical certificate for even one day’s sick leave. Doctors have said this is unworkable. It would also pressure people to spread their germs at work or to ignore a sick child’s need to be cared for at home. Any employee can be sacked within 90 days without reason or redress. Changing your job will put your employment security at risk. It will be an uphill struggle to get another job with a dismissal on your record, however unfair. And imagine the effect on a young person’s confidence at the start of their working life. It will be even tougher for anyone to take a case against unfair dismissal. Dismissal is serious and means the loss of livelihood which is why we need fair processes. The government’s proposal to weaken fair process flies in the face of good workplace practice. It will be harder for people to seek help from a union organiser. Employer consent will be required. Most employers value a good relationship with the union. But this change would provide a shield for bad employers. Four weeks’ holiday leave is at risk. The fourth week’s annual leave can be cashed up. Some will be under pressure to do this. It will be a first step to reducing the minimum four weeks’ holiday entitlement. Employers will be able to bypass your union and go directly to members during bargaining. This tips the balance further towards the employer and will invite subtle intimidation during a tense time. How can we create a good welfare system for all?